Now that the chill is in the air and starting to get even chillier, it’s time to bring out the rib-sticking, hearty soup that Grandma made. 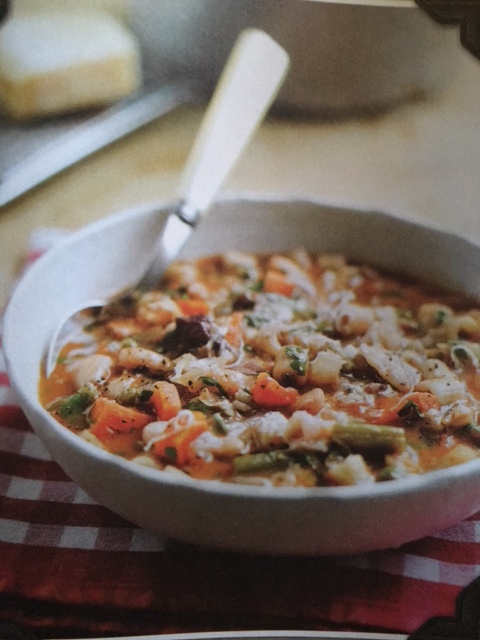 Minestrone is one of the most popular Italian soups and is full of vegetables, beans and small soup pasta. 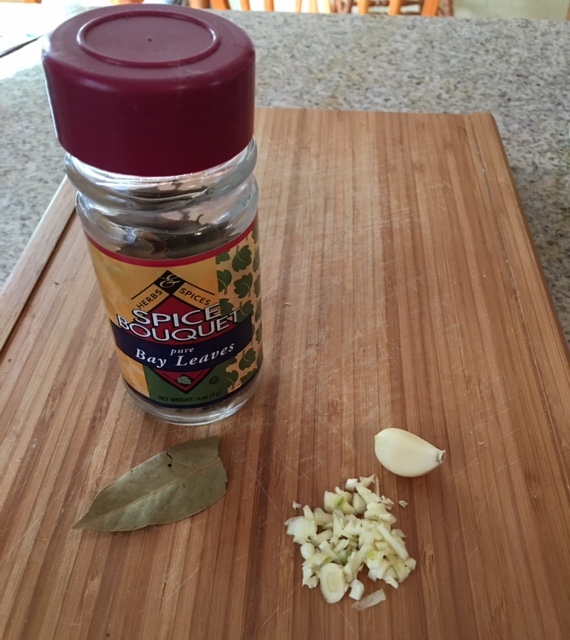 It is easy to prepare and will fill you up on a brisk fall or winter day. In fact, minestrone is so good all year round. Let’s first take a look at what you’ll need and then we’ll look at the directions for the recipe. 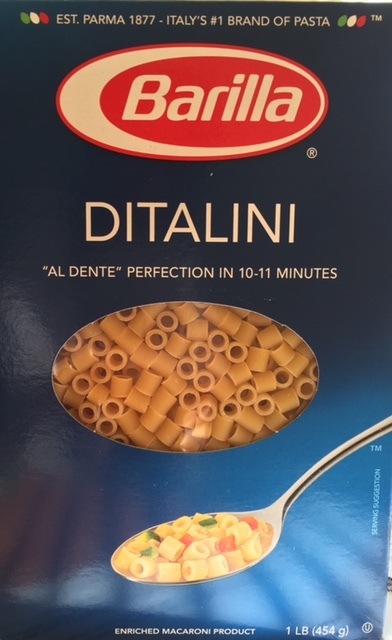 Personally, I love to put 2 types of beans plus small pasta called “Ditalini” in my soup as well as lots of veggies. 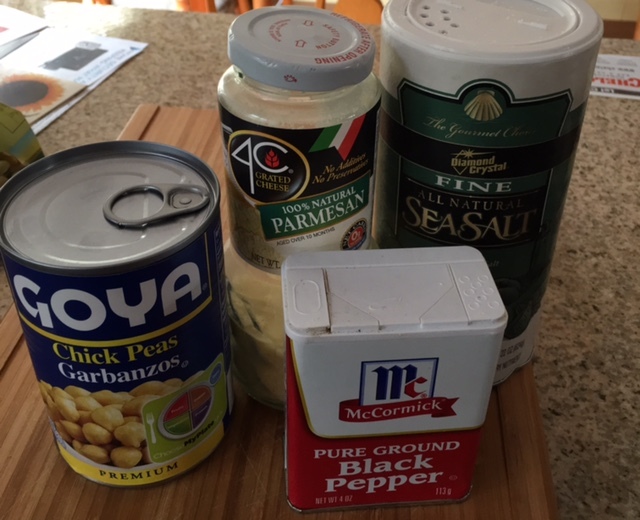 Feel free to add other veggies or soup pastas like “Small Shells” if you wish. You will need a large saucepan and the ingredients listed below. Heat the oil slowly in a large saucepan over medium heat. Add the chopped onion and garlic and cook over low heat, stirring occasionally until the onion is soft. Be careful not to burn them (about 5 minutes). Pour in the vegetable broth and increase the heat to medium. 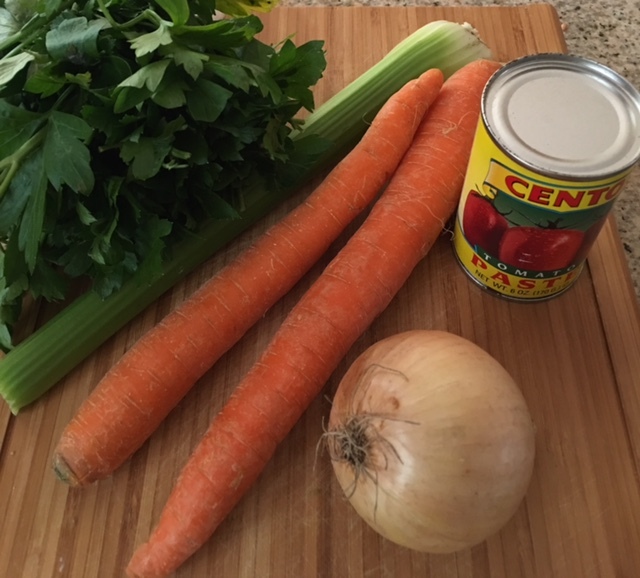 Add the cannellini beans, tomatoes with juice, tomato paste, sugar, green beans, carrots, celery, parsley, bay leaf, basil, pasta, and chickpeas. Cook for 25-30 minutes until vegetables are tender and pasta is al dente. Stoves may vary on cooking times. Season with salt and pepper. Lower the heat to simmer. Ladle the soup into warm bowls and serve immediately with parmigiano cheese on top. Hope you’ve enjoyed this lazy afternoon recipe. Perfect for your football weekend! Have a great one, see you Tuesday! Tested in the THASC kitchen with Italian love. 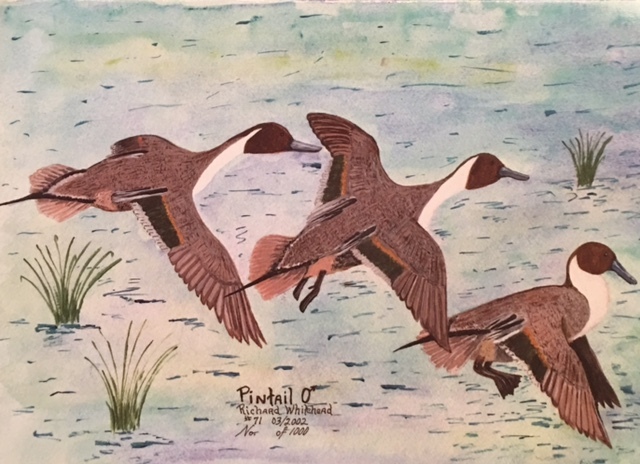 “PINTAIL DUCKS” is an original acrylic painting by Richard Whitehead, resident of the Pelican State, Louisiana. In 1996, Richard was diagnosed with chronic degenerative multiple sclerosis. Art gives Richard a pathway to be constructively involved. This greeting card was reproduced from an original artwork by Richard Whitehead for THASC Sales Co. in Margate, FL. THASC has employed a unique group of handicapped artists who create art to help rehabilitate themselves. They gain self-respect and pride through their artwork. The Pintail duck, as you can guess, gets its name from the male’s long tail feathers, which has central feathers up to four inches long. Male pintails, or drakes, have much more elaborately colored feathers than their female counterparts, called hens. The northern pintail is a graceful water bird with long, narrow wings and a long, elegant neck. A northern pintail is very nimble on land, but is particularly graceful in flight. THASC artist Richard Whitehead depicts them perfectly in his painting which shows the birds reach great speeds while flying, and thus have earned the nickname “The Greyhound of the Air”. The Northern Pintail is one of the most numerous species worldwide, after the Mallard. Even today their worldwide population is between 5 and 5.5 million birds. They have been found on every continent except Antarctica. In his painting Richard shows their wide wingspan, which is between 30-38 inches. Drakes measure from 20 to 30 inches long, while hens measure 20 to 25 inches. To see Richard’s ducks in flight, would one imagine that they are enduring fliers capable of flying up to 65 miles per hour? In fact, birds tagged in North America have been known to make trans-Atlantic flights and have been found in Europe days later! Pintail ducks chose new mates every year when they breed between April and June. Several males often court one female. Female hens will primp their desired drakes. Male pintails make sounds like a whistle whereas females sound like a husky “quack”. The hen will lay between 5-10 pale olive eggs which are incubated between 21-25 days. Soon after the ducklings hatch the female leads them to the water to feed on dead insects until they grow their plumage about 45 days later. Interestingly enough, the drakes usually leave the breeding areas before the hens to go to moulting locations where they do not fly for four weeks so they may shed their feathers. They then migrate to wintering places from mid-August forward. 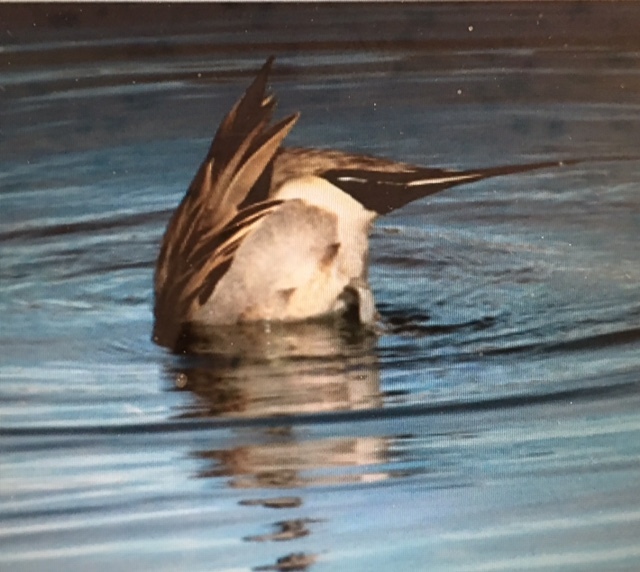 The long necks of the pintails allow them to bob for food in shallow waters up to one foot (usually at night) and they can eat everything from aquatic grasses and plants to frogs, insects and small fish. Since the Northern Pintail is heavily exploited by hunters in North America, it may also fall prey to feral cats and rats on a few islands and in addition is vulnerable to outbreaks of bird flu. 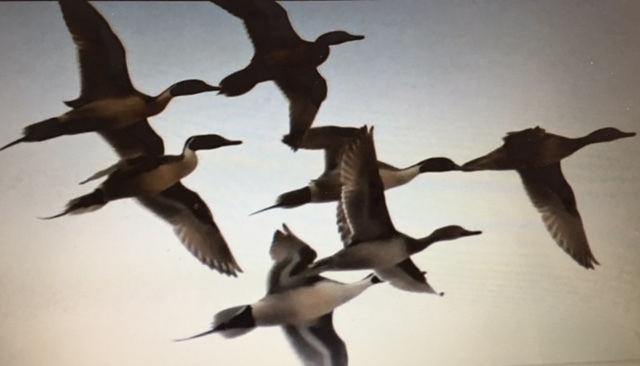 Because they breed in grasslands near freshwater or salty lakes, rivers, and ponds where it builds its nests, a treaty between Canada, the United States, and Mexico has encouraged private landowners to be working with the governments to protect wetlands important to the Northern Pintail. The number of Northern Pintails hunted each year has been reduced and hunting off-season is illegal and can lead to a fine or jail. Richard Whitehead’s love of nature, and especially of birds, has given us a flawless representation of this graceful, elegant duck. We can admire them mostly everywhere we find water be it in a small pond or a beautiful park like I did last week. There is nothing as precious as watching little ducklings waddling after their Mom to feed and certainly nothing as precise as watching the greyhounds of the air take flight. Hope you enjoy another lovely part of the season. “ON ALERT” is an original acrylic painting by Jim Mesick, resident of the Empire State, New York. Jim was left a paraplegic from a life threatening accident. Jim is not just a fabulous artist but also an excellent athlete winning a title for weightlifting. This greeting card was reproduced from an original acrylic painting by Jim Mesick for THASC Sales Co. in Margate, FL. 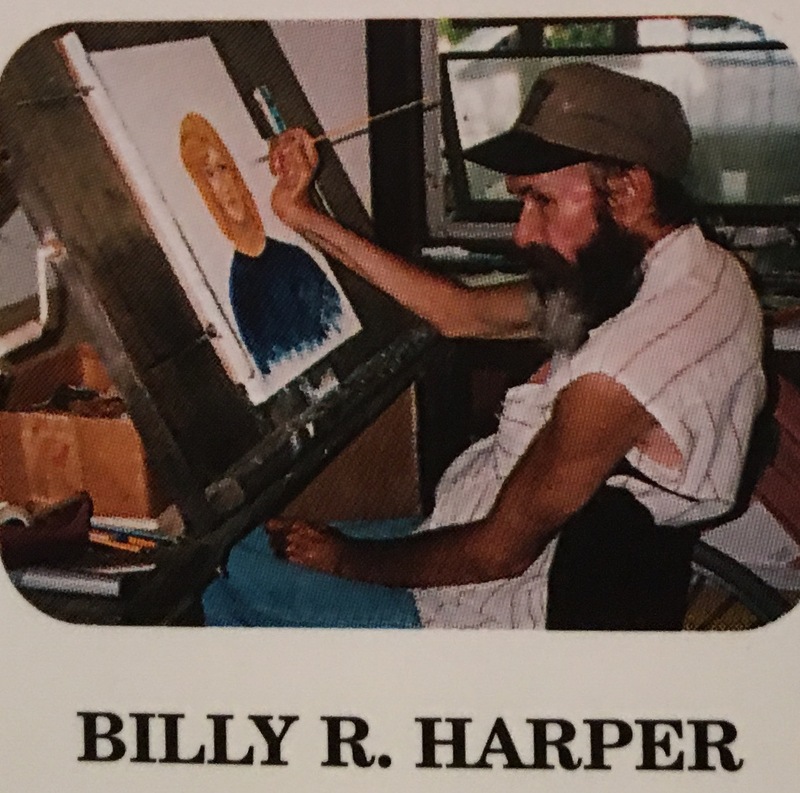 THASC has employed a unique group of handicapped artists who create art to help rehabilitate themselves. They gain self-respect and pride through their artwork. 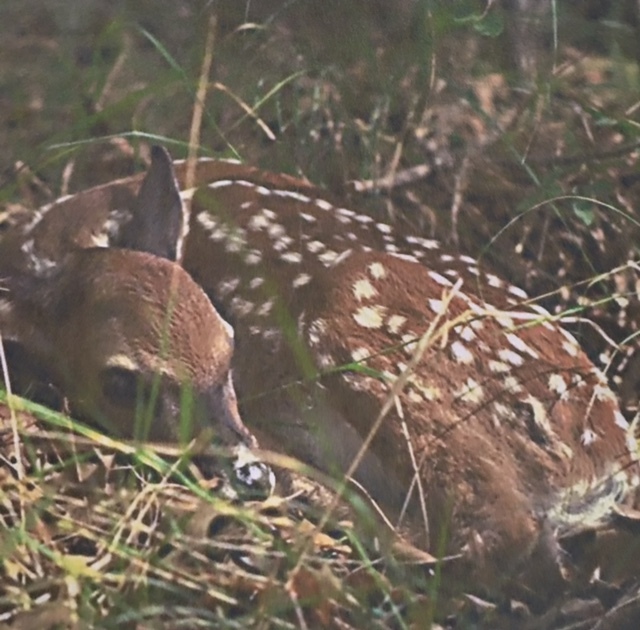 I thought it was something seeing a deer and her fawn in my backyard last summer. 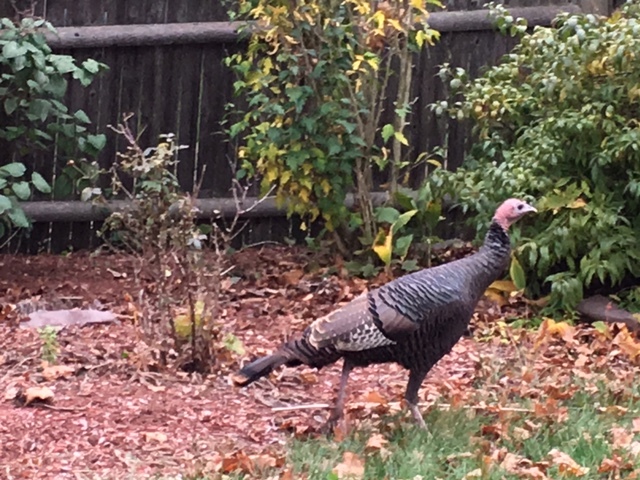 A few days ago a flock of wild turkeys invaded and I was surprised to see how big they are, looking larger than Canadian geese in comparison to their domestic cousins. In fact, they are the second largest North American bird after the trumpeter swan. Male “Toms” can grow up to 4 feet tall and weigh over 20 pounds. Wild turkey populations have increased sharply since 1966 and it is estimated that the global breeding population of 7.8 million, has 89% occurring in the United States. 21% of all U.S. hunters (about 2.5 million of them) chase turkey, the second most sought game after deer. 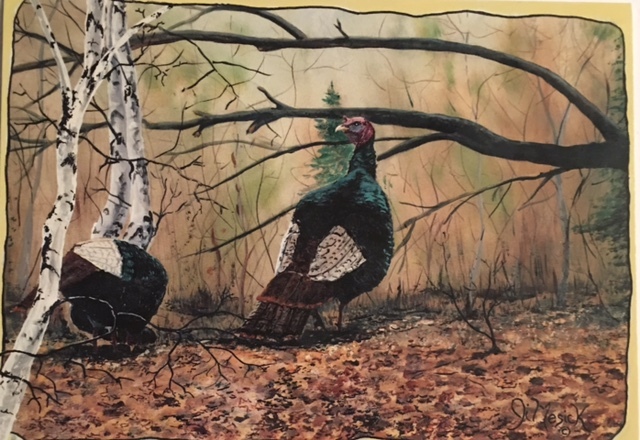 We can, therefore see how THASC artist Jim Mesick captures that look of “ON ALERT” in his wild turkey in his painting. As he shows us, wild turkeys live year round in open forests in 49 states (except Alaska) and parts of Mexico and Canada. Their English name of the bird may come from the early routes that they passed through while being shipped through the country of Turkey on their way to European markets. While many of us are delighted to see these birds back in their “glory”, many consider them a big nuisance, especially if they take up residence in your back yard. 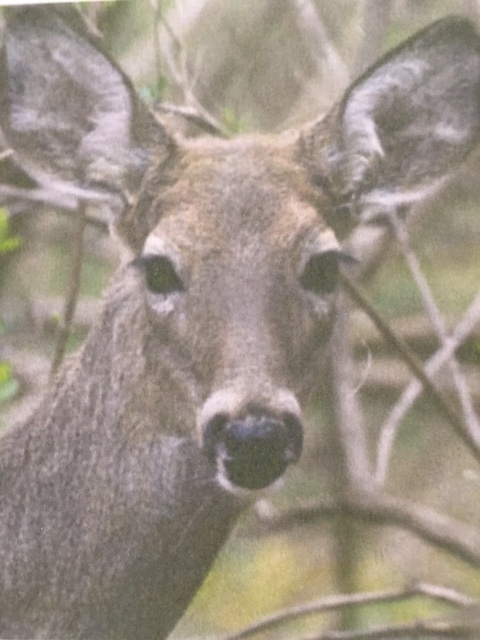 Their big feet can do a lot of damage in your grass and through your flower beds. 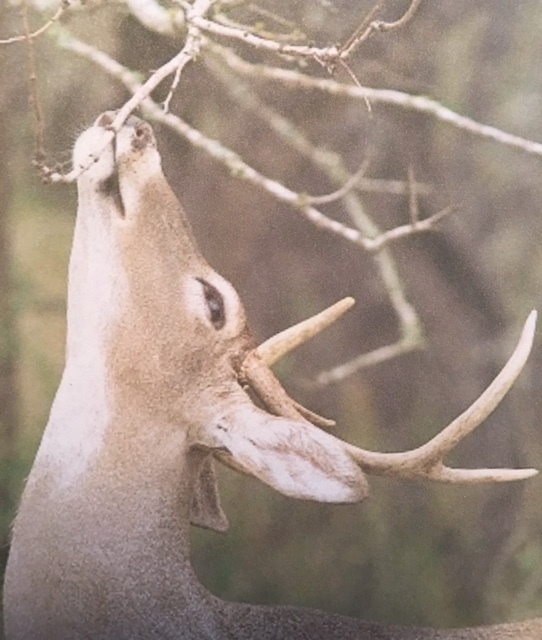 It’s not so much for the damage they may do compared to deer, but their turkey droppings can at times blanket the lawn and so as to hinder outdoor activities. Wild turkeys rummage with their flocks to eat plant matter mostly on the ground and sometimes in low trees and shrubs. They supplement their plant diet with acorns, berries, fruits, nuts and seeds. They also dig up plant bulbs in Spring if they cannot find nuts and add beetles and other insects to their diet. Compared to other wildlife like coyotes or racoons, turkeys don’t pose a threat. Male wild turkeys don’t provide any parental care. When newly hatched chicks are born, they follow the female who will feed them for a short while and then they will find food on their own. Courting males “puff” themselves up into big feathery balls and continue to gobble to attract females and also to warn their competitors. They also display for the females by opening their fanned tails and lowering their wings. Males breed with multiple mates, but leave the chick rearing to the females. Wild turkeys get around by walking, although when they need to, they can swim, spreading their tails and kicking. They can also run and fly, but females tend to fly while males tend to run. Hens usually lay one egg per day over 2 weeks and sometimes for 2 or 3 days she won’t lay an egg in that time frame. 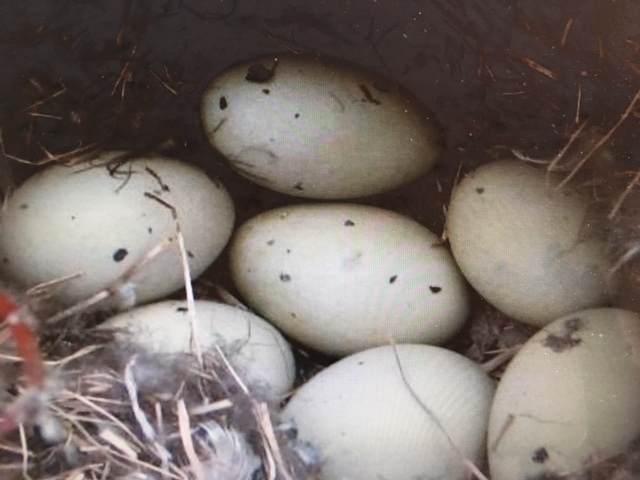 She won’t sit on her nest until her last egg is laid, when she will then spend 28 days on the nest leaving only once a day for food and water. At dusk, turkeys fly into the lower limbs of trees and continue to move upward to a high spot to roost. Jim Mesick depicts his turkey with a fixed glance, almost as if he is being hunted. His hunters include coyotes, raccoons, horned owls and especially people. They also have nest predators which include foxes, snakes, raccoons and rodents. 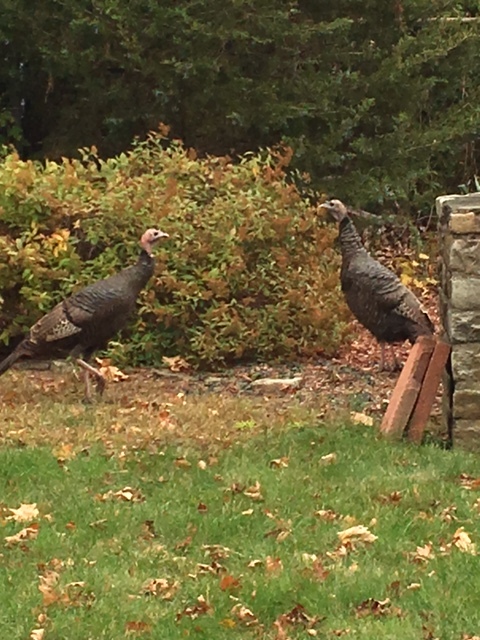 I never once feared the wild turkeys that came into my yard and they seemed pretty much like they ignored me. You can see by my photos how close they allowed me to come. They really are lovely creatures and, for one, I was happy to have them pay a visit. I loved sharing their beauty with you through Jim’s painting and am trying harder not to think about Thanksgiving! Stay safe this weekend and enjoy Hallowe’en! “FALL COLORS” is an original acrylic painting by Jim Mesick, resident of the Empire State, New York. Jim was left a paraplegic from a life threatening accident. Jim is not just a fabulous artist but an excellent athlete, winning a title for weightlifting. 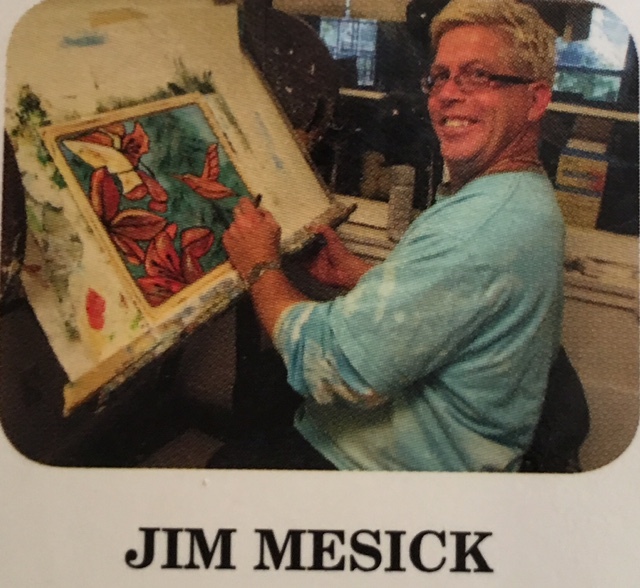 This greeting card was reproduced from an original acrylic painting by Jim Mesick for THASC Sales Co. in Margate, Florida, which has employed a unique group of handicapped artists who create art to help rehabilitate themselves. They gain self-respect and pride through their work. I figured that this would be the last blast of autumn foliage until next autumn, but this greeting card is too gorgeous and fiery to leave it out of our autumn collection. I actually saw a friend of mine on Facebook who made a comment about being in a town called Wrentham, MA (not very far from Boston) and her comment was, “It’s snowing here.” That was enough for me. So we still have some time to think of this wonderful season, which seems more like this wonderful month! 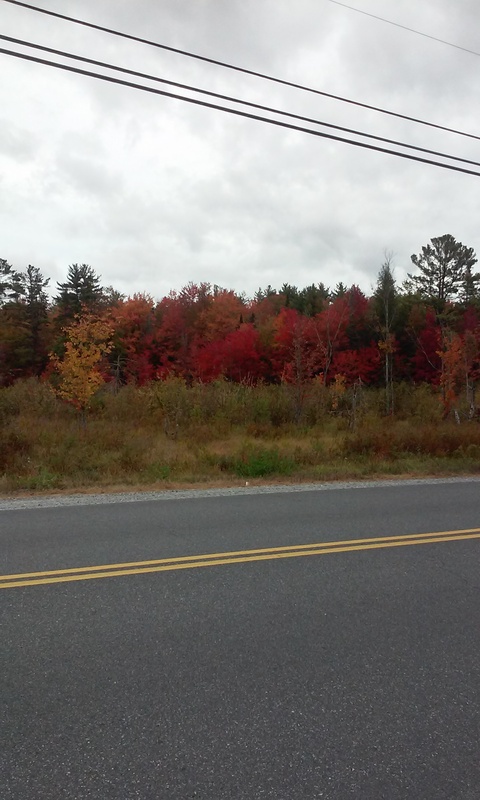 Have you ever thought of why leaves change color in Autumn or why maple trees turn bright red? I did some research and have a few answers that may interest you. 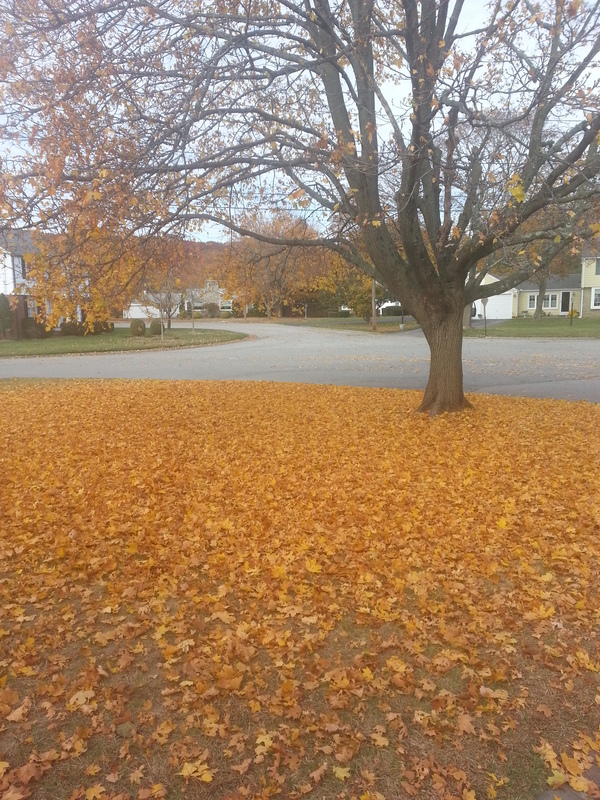 Leaves are nature’s food factories. They use sunlight and chlorophyll to give plants their green color through a process called photosynthesis. When summer ends and winter approaches and the days get shorter, trees “know” it’s time to get ready for winter. The leaf has actually been preparing for autumn since it started to grow in the spring. Without fresh water to renew the leaf, the chlorophyll begins to disappear. As the bright green fades, we begin to see yellow and orange colors like we see in THASC artist’s Jim Mesick’s painting above. Some of these colors have been in the leaves all along but we can’t see them in summer because they are covered by chlorophyll. The bright reds and purples however are made mostly in the fall. 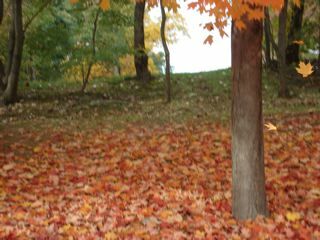 In maple trees like we have in the northeast, the sun and cool autumn nights (when the chlorophyll disappears from the leaves) cause the glucose left in these leaves to turn to a red color. Orange colors come from carotene and the yellows from xanthophylls which are common pigments found in flowers and foods like carrots, bananas and egg yolks. 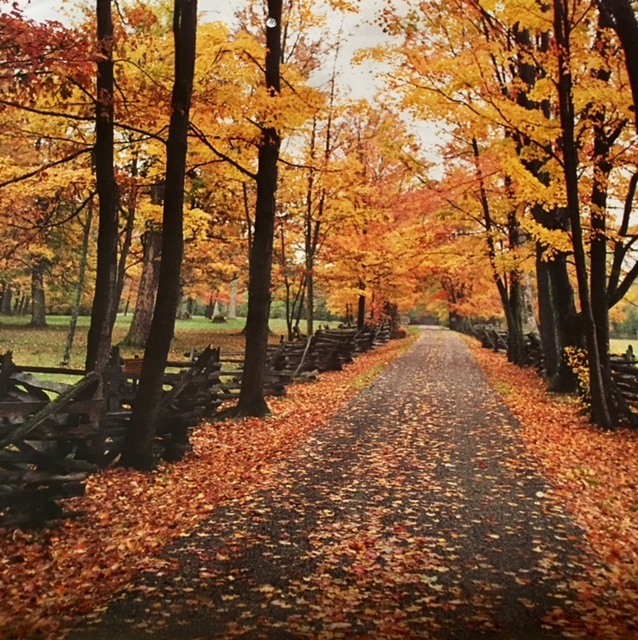 Jim Mesick’s painting is most definitely the eastern United States where trees like maples, oaks and elms shed all their leaves in the fall in preparation for winter. Other trees like “Evergreens” keep most of their leaves during winter because their special leaves are resistant to cold and moisture loss. They continue to photosynthesize during the winter. We see this evergreen tree as well in Jim’s painting on the left side in contrast to the bright colors of the deciduous trees along the lake. Although these brightly colored trees shed their leaves after a short while, I would prefer to live in the glory of their short life span rather than no color at all as in many parts of our world. Jim Mesick affords us through his precious painting to live this brief love affair with Fall every year. For that, I thank him. as we shall FALL BACK on Sunday, November 1. See you again on Tuesday. “OLD HOMESTEAD” is an original oil painting by Jo Hardin, resident of the Magnolia State, Mississippi. Jo suffers from Amblyopia with complications of glaucoma causing her to be visually handicapped. This greeting card was reproduced from an original artwork by Jo Hardin for THASC Sales Co. of Margate, Florida, which has employed a unique group of handicapped artists who create art to help rehabilitate themselves. They gain self-respect and pride through their artwork. I remember as a child growing up in the 50’s, I always dreamed of having a farm. I used to love to go with my Dad to the local farms near-by and get fresh sweet corn. 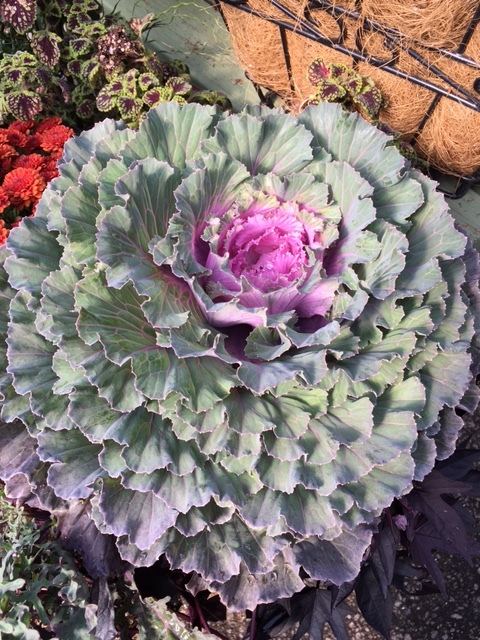 I could always see myself owning a farm with my love of animals and all, but especially to grow and eat fresh produce. There was nothing like that fresh honey and sugar sweet corn from Plainfield Pike, and the farmstead seemed so idyllic then. 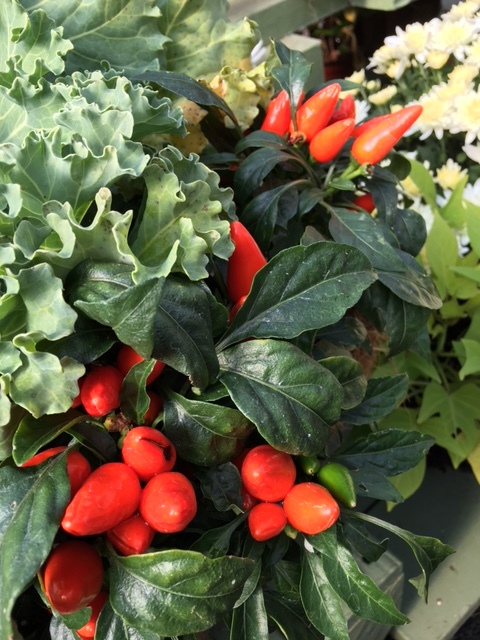 I especially liked to look at the other colorful fresh produce and flowers, so much that it has remained on my bucket list even now. 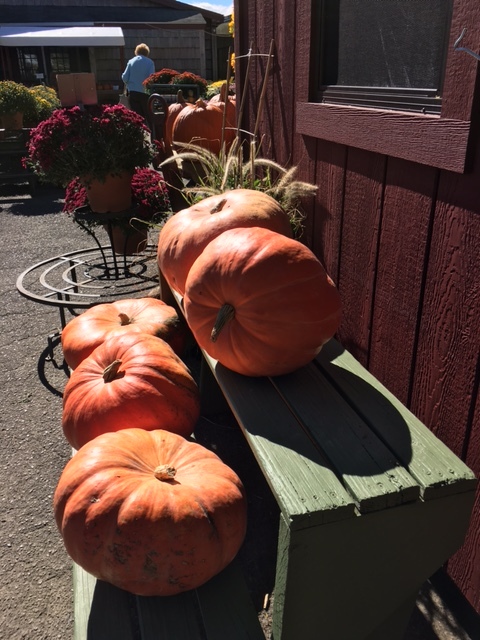 Especially in Autumn everything looks so much better on a farm, perhaps because there are added pumpkins, mums, sunflowers and all sorts of fresh seasonal pies, like apple, squash and strawberry rhubarb. THASC artist Jo Hardin has certainly brought back to life one of the old farmsteads in autumn of my youth complete with the changing foliage, bales of hay and rows of fresh flowers. Autumn is such a fast moving season here in New England, and so each weekend, especially in October before all the beautiful leaves have fallen, we try to take advantage of the weekends to visit local farms and buy pumpkins and Indian corn for decorating our homes as Hallowe’en draws near. 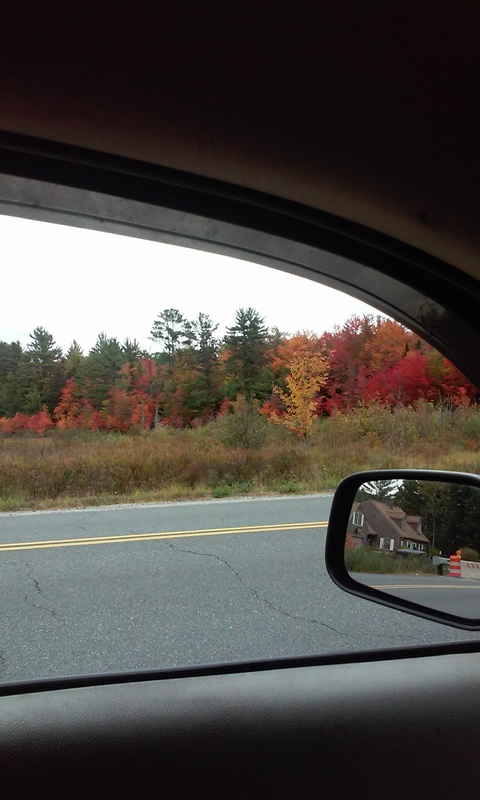 In fact today my friends and I decided to take our second foliage ride of the month and head to southern Rhode Island again on another suggested route by our town newspaper. On the way we stopped at a farm very familiar to Rhode Islanders which was founded in 1902, and besides its beautiful greenhouses, Schartner Farm has a wonderful corn maze and petting zoo for the children. This farm is a year-round farm between North Kingstown and Exeter. It is owned now by a URI alumnus, Richard Schartner Sr., and his family. 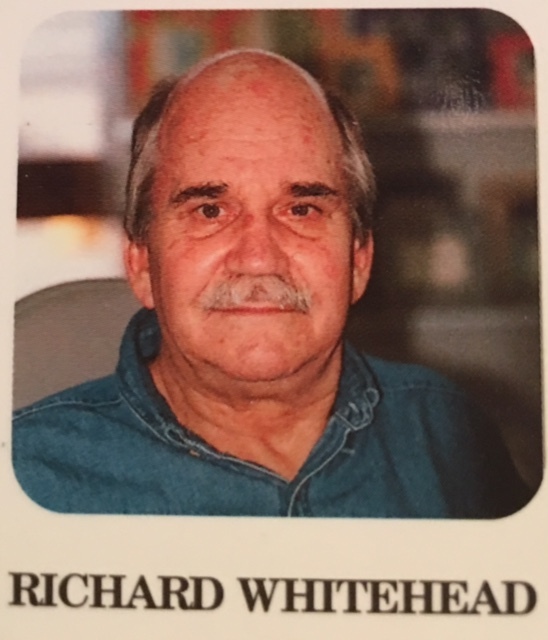 Richard’s father and uncle had a farm stand and restaurant on Boston Neck Road in the late 1940’s—early 50’s when I was growing up. Then, the Schartners had a real steam train kids could ride. Unfortunately there isn’t a train at the farm today, but it’s still loaded with tourists. In contrast to this big complex farm, it should be mentioned that other farming operations serve as contrasts. CSAs or Community Supported Agricultures are so popular now mainly, for the most part, they do not use pesticides. While the crops may vary from one CSA to another, one thing they have in common is that people join them for a fee and for a year they are entitled to a continuous supply of organic fruits and fresh vegetables along with various herbs. They can pick these up regularly and nowadays CSAs are popular to an increased health-conscious population. No matter what your produce of choice may be, Jo Hardin’s “OLD HOMESTEAD” brings me back to my wonderful childhood and how many Americans still make a living farming the land in one way or another to keep themselves and the rest of us healthy. 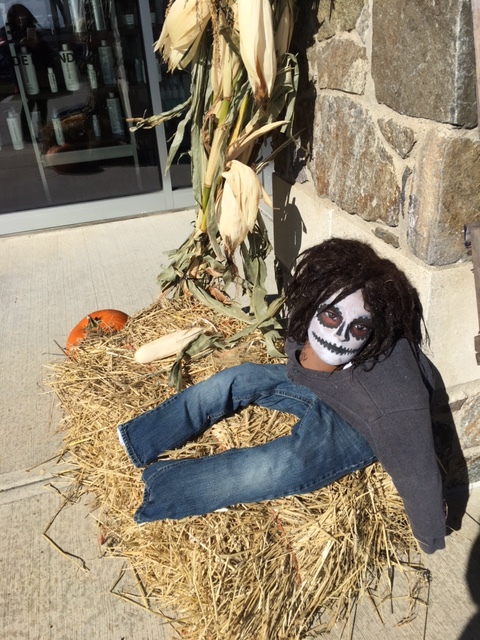 Join me on Thursday as we continue to enjoy Autumn and inch our way closer to Hallowe’en. “PEACEFUL NIGHT” is an original acrylic painting by Melfred Teller, resident of the Natural State, Arkansas. Melfred was born with ROP or Retinopathy of Prematurity. He is blind in his left eye and almost in his right. Melfred is a Native American from the Navajo tribe. 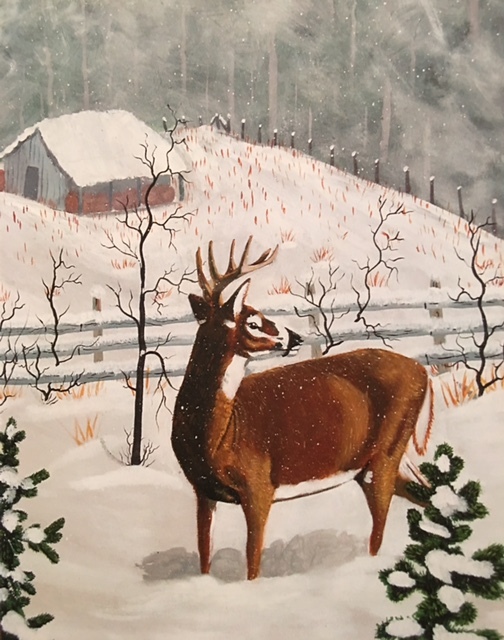 This greeting card was reproduced from an original artwork by Melfred Teller for THASC Sales Co. which has employed a unique group of handicapped artists who create art to help rehabilitate themselves. They gain self-respect and pride through their artwork. 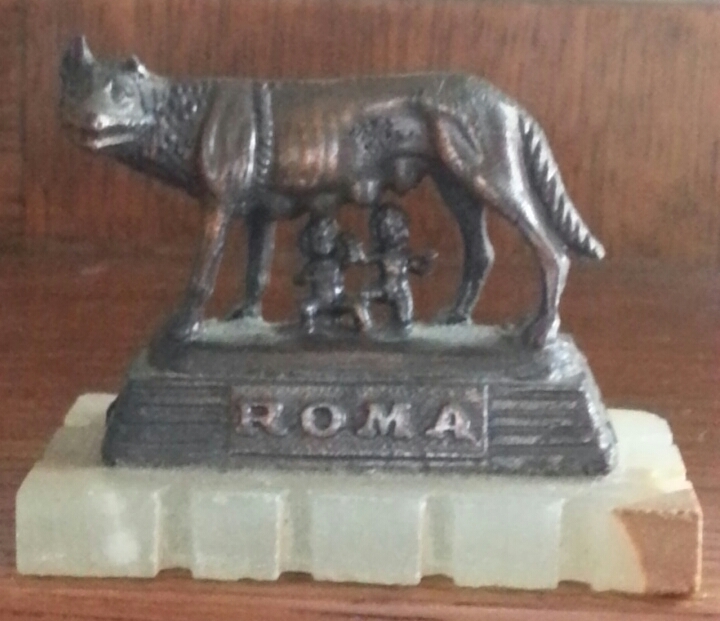 I suppose that I was born with wolves in my blood (my father was of Roman descent) if there were any credence to the legend of Romulus and Remus. For those of you who are not acquainted with the legend, it goes like this. Romulus and Remus were twin brothers who were abandoned as babies and put into a basket that was then placed into the Tiber River. When the basket was stranded at the side of the river, it was said that the twins were discovered by a she-wolf and the wolf nursed the babies. When Romulus and Remus became adults, they decided to found a city in the same spot where they had been found by the she-wolf. After quarrelling over the site, Romulus killed his brother Remus and as the sole remaining founder of the city, he named it Rome. This legend is exactly that, a legend. Yet in the Piazza of the Campidoglio in Rome, at the top of a pillar, you will still find this statue. Let me tell you about some interesting facts about wolves, and then we’ll talk about their domestic counterparts, our dogs. Wolves are 10 times more intelligent than the smartest dogs and are the largest of the dog family, with adult males weighing between 95-100 lbs. The jaw pressure of a wolf is two times the jaw pressure of a German Shepherd. 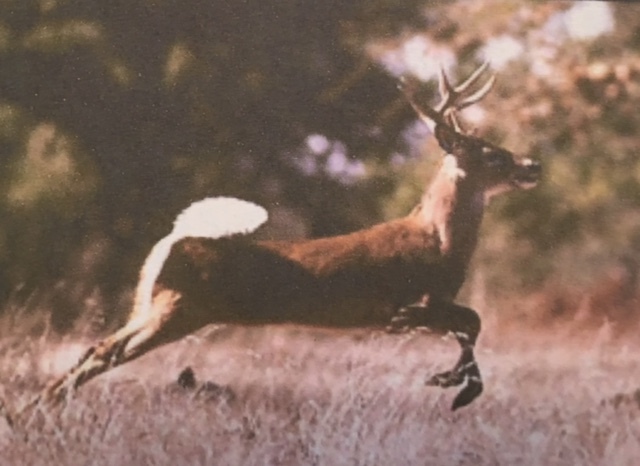 They even resemble German Shepherds but their legs are longer, their feet are bigger and their fangs can grow up to 2” which makes it easy to rip apart their prey like deer or elk. They can see and smell a deer from more than a mile away. Wolves can eat up to 20 lbs at once but many die of starvation, (feast or famine), because of the lack of food in the wilderness. THASC artist Manfred Teller’s wolves in his painting are most likely arctic wolves which inhabit the far north. 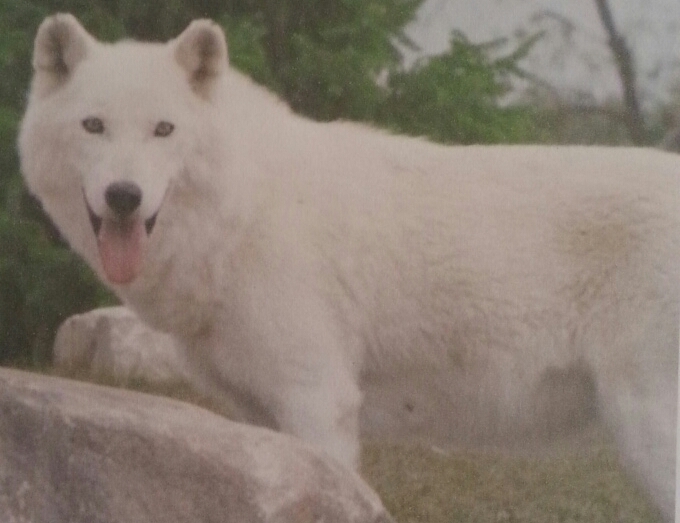 Adult wolves like these have the ability to adjust their body temperature to adapt to changes in the weather. In extreme cold weather, wolves can restrict the flow of blood to the skin to conserve heat. They have both a fur coat and a thick undercoat, and the overcoat is long and thick. Most wolves are gray. Today about 50,000 gray wolves inhabit Canada, while Alaska has 10,000, and the rest of the United States has less than 1,300. They also live in China and Russia. Wolves spend 8-10 hours on the move and can run up to 35 mph. Let’s talk a bit about why wolves howl and their association with the moon. The truth is that wolves (Canis lupis) don’t howl at the moon. Scientists have found no correlation whatsoever, so then, what do they howl at? 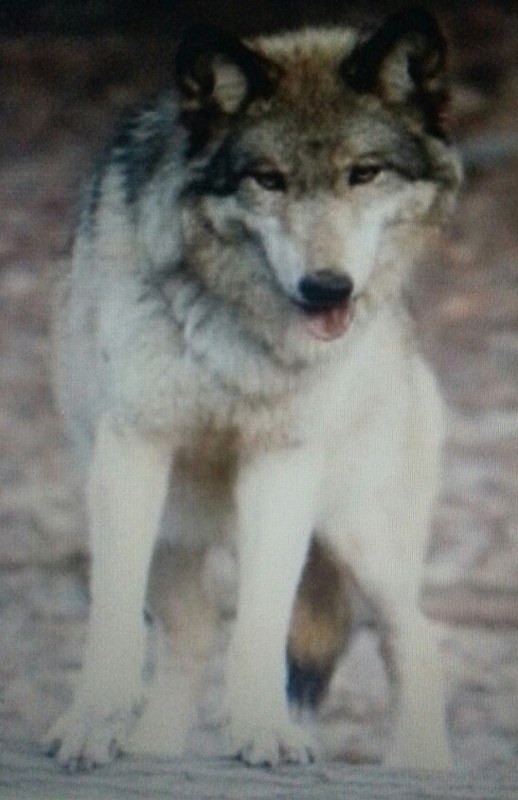 A wide range of theories has been identified: First, wolves pipe up a lot during the night because they are nocturnal. They howl to assemble their pack (wolves live and hunt in packs of about 6-10 animals), to greet each other, to identify their location, to attract a mate, to scare off enemies or simply howl when they wake up… like when we yawn in the morning, or simply because of the “lonesome wolf” cry. A compelling theory here is that howling reaches a peak in the winter months, during the time of courtship and breeding. This certainly seems to be the case in Teller’s “PEACEFUL NIGHT”. So where does the moon come from? Some think that this whole moon-howling rumor stems from Native American art and mythology. 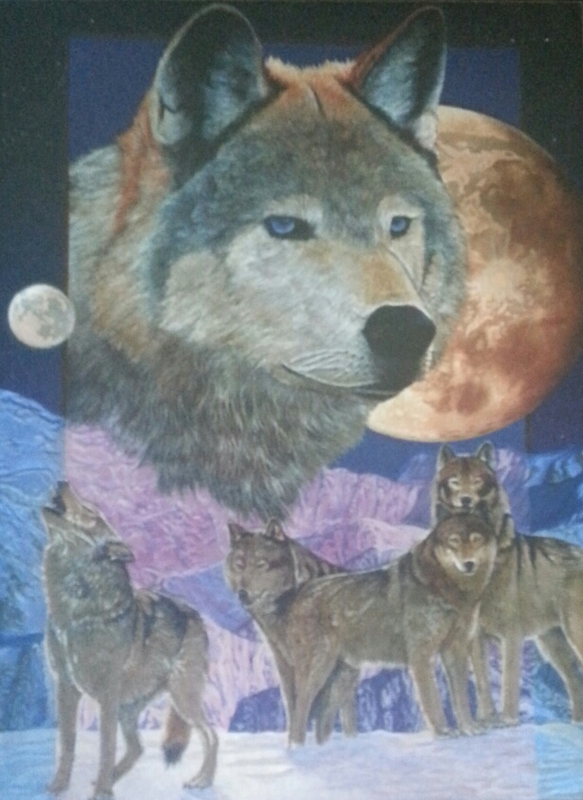 For example, The Native American Seneca tribes believe that a wolf sung the moon into existence. And now we’ll talk about some of the differences between wolves and man’s best friend, the dog. The first thing you notice about a wolf is its piercing yellow eyes. Most dogs have brown eyes or sometimes blue. Wolves’ heads are larger because their brains are larger and therefore are more intelligent.. We know the dog is a domesticated form of the gray wolf and dogs are seen in any place that is inhabited by people. Because dogs are domesticated, they have a weaker basic instinct to hunt. Wolves hunt in packs and have stronger molars than dogs, allowing them to rip open their prey’s throat or to crush large bones. Dogs need exercise like a daily walk. Wolves walk all day, every day. The paw of a dog is half the size of a wolf’s. Dogs are affectionate if taken care of, but wolves are wild animals and should not be bothered for affection. Dogs always live near humans, even if they are ownerless. Wolves love to live in packs away from civilization. Last year about this time, I went to the Mohawk Trail up north and stopped in a souvenir shop. 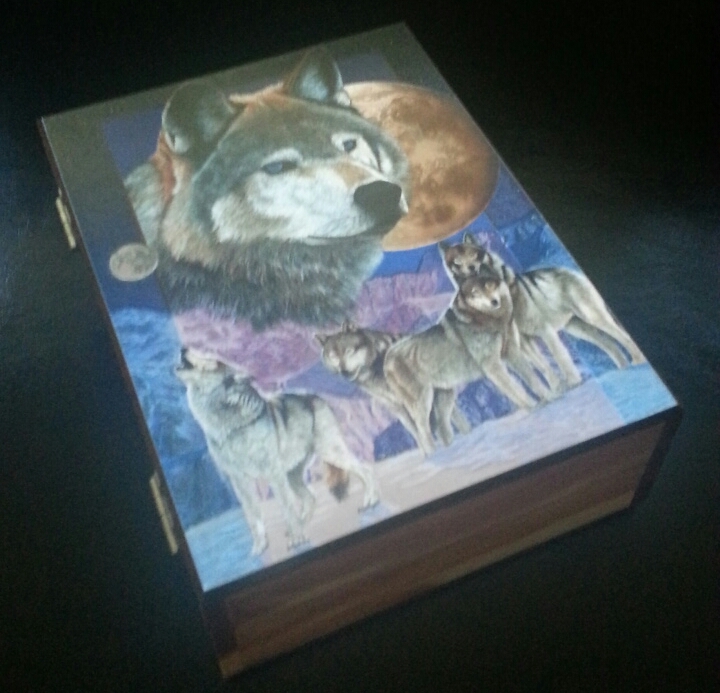 I was immediately drawn to a box with wolves painted on top. 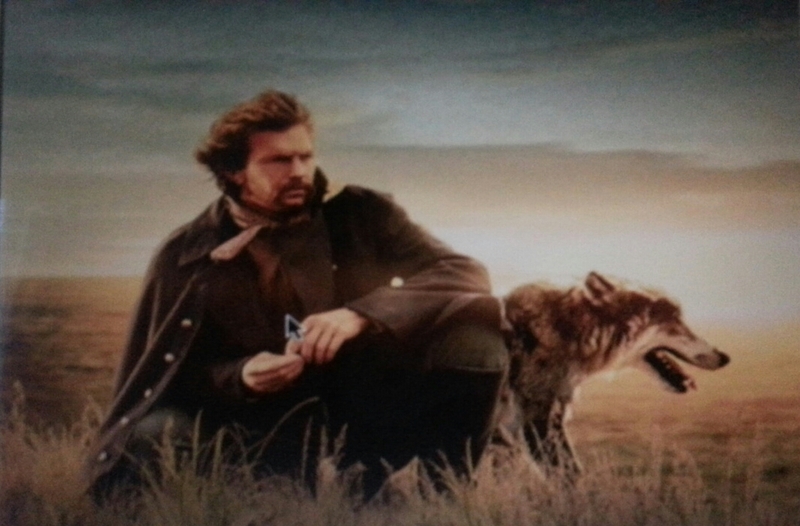 Since seeing the movie Dances with Wolves back in 1990, with Kevin Costner and that dear little wolf “Two Socks”, I have been fascinated with these mysterious animals and, with Hallowe’en coming around the corner, I still like to believe they are howling at the moon! 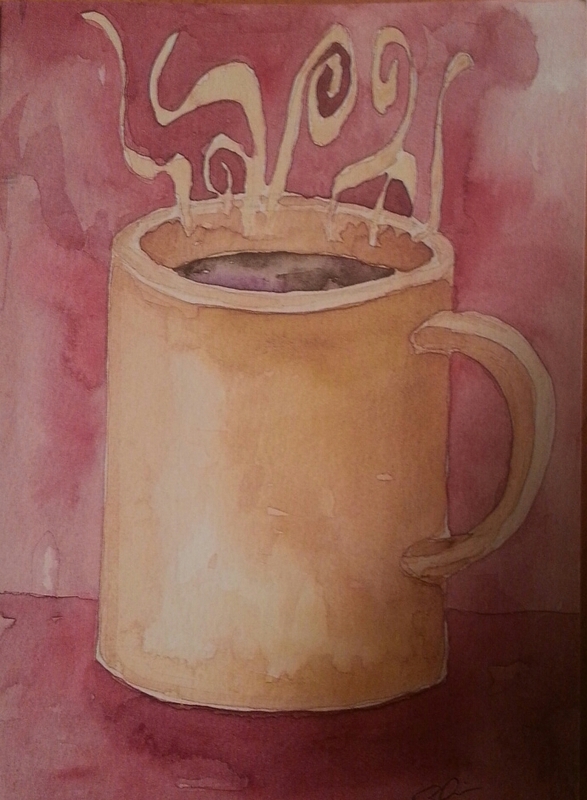 “JAVA” is a watercolor painting by Christopher Kuster, resident of the Sunshine State, Florida. 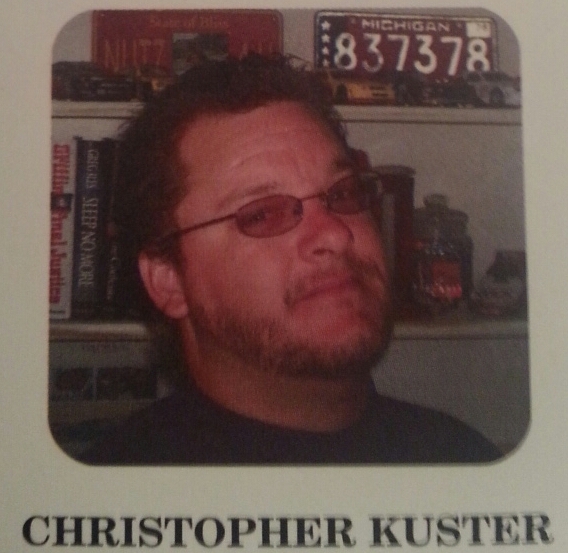 Christopher is a Quadriplegic from a swimming accident in 1992. Christopher paints with a brush held in his mouth and enjoys spending time with his art. This greeting card was reproduced from an original artwork by Christopher Kuster for THASC Sales Co. which has employed a unique group of handicapped artists who create art to help rehabilitate themselves. They gain self-respect and pride through their artwork. Did you ever wonder where the expression “cup of Joe” came from? After discovering that the original theory could not be true, I decided to dig deeper. For the record, the original theory dated back to the World War I era when Josephus Daniels became secretary of the Navy under President Woodrow Wilson and banned the consumption of alcohol, which, it was said, led to the stewards increasing their purchases of coffee. As a result, the coffee became degradingly known as a “cup of Joe”. This theory was faulty because of the timing of the General Order 99 in 1914 and the spirit ration being abolished in 1862 to already dry ships. Over history, calling the beverage “joe” had 2 stronger theories, but no proof. One of them affirms that “joe” is a contraction of two other jargon terms for coffee: java and jamoke, jamoke being formed by the words java and mocha. Thus it went from a “cup of jamoke” to “a cup of joe”. The last theory stated that since “joe” was a term used for “typical guy, fellow, chap” (dating back to 1846), “a cup of joe” referred to a common man’s drink much as it was used with any other member of a group having common interests like “the average Joe”, “Joe College”, “G.I. Joe”. “Cup of Joe” seems to go with the beverage of the common man with this theory. The best theory seems to be jamoke changing to joe since Java was the primary source of where the world’s coffee came from in the 19th century. It was believed by historians that coffee plants were found in the year 850 in Ethiopia and then 50 years later were taken to the Arabs. Despite the Arabians guarding their coffee seeds, some were smuggled to the Dutch and in turn made their way to Indonesia in the 17th century and were planted in Sumatra and the island of Java. Thus java was one of the earliest plantations of coffee and still exports coffee now. THASC artist Christopher Kuster titles his painting “JAVA’ for the reason that, like wine, coffee is classified by its region and species. By saying, “ I’ll have a cup of Java” is similar to saying, “I’ll have a glass of Chianti”. I am not, nor have I ever been, a coffee drinker in my life unlike my mother who downed at least 8 cups a day, including at bedtime. She was like most of the 80% of adults who consume caffeine every day. According to the FDA Americans consume 400 million cups of coffee a day, which is equivalent to 146 billion cups a year. Some other interesting facts about coffee are that dark roasts have less caffeine than lighter roasts, even though the flavor is stronger. Coffee is the second most traded commodity in the world, the first being oil. The majority of coffee (40%) is produced in Brazil which is twice as much as Colombia and Vietnam, it’s second and third place competitors. Believe it or not, Hawaii is the ONLY U.S. state that commercially grows coffee! However, New Yorkers drink seven times as much coffee as the rest of the country. Finland is on top for being the most caffeinated country where average adults consume 4-5 cups a day. 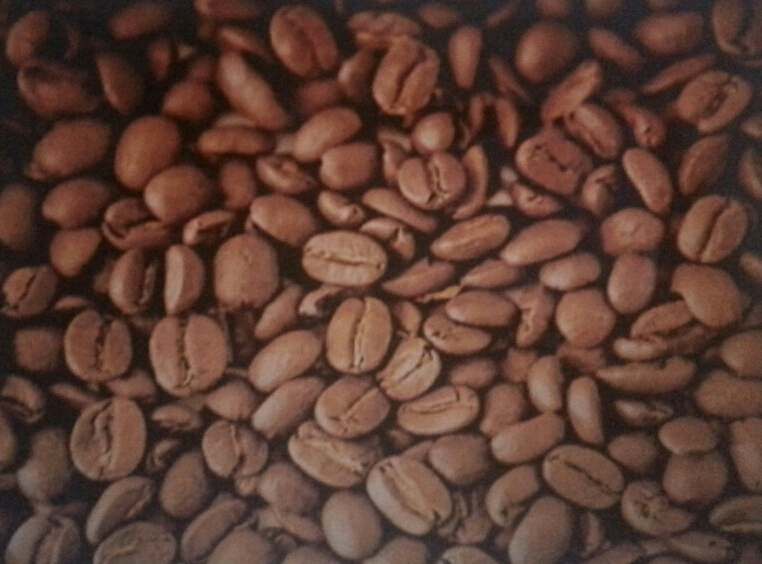 I’m sure coffee drinkers must know there are two types of coffee beans: Arabica and Robusta. 70% are Arabica but Robusta has twice as much caffeine. I really wonder where my taste for coffee flavors comes from as I don’t like coffee. 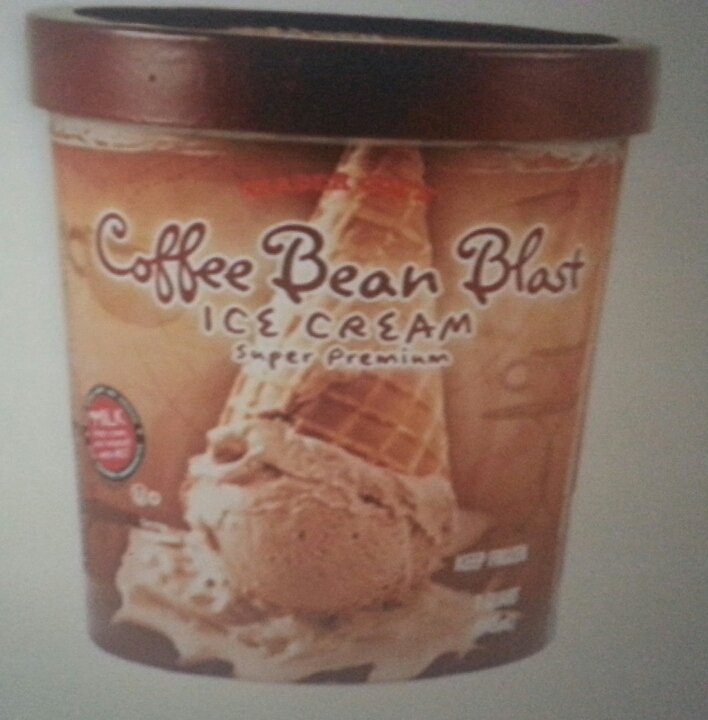 For example, my favorite ice cream, by far, is coffee and I love coffee syrup used in milk to make frappes or, as we call them in Rhode Island, “coffee cabinets”. I suppose that is what intrigued me to find out so much about “Java”. Coffee beans are grown on bushes and are actually the pits of a cherry-like berry, making it part of a fruit. It is a called a bean because it resembles real beans, but is actually a seed. Imagine that! 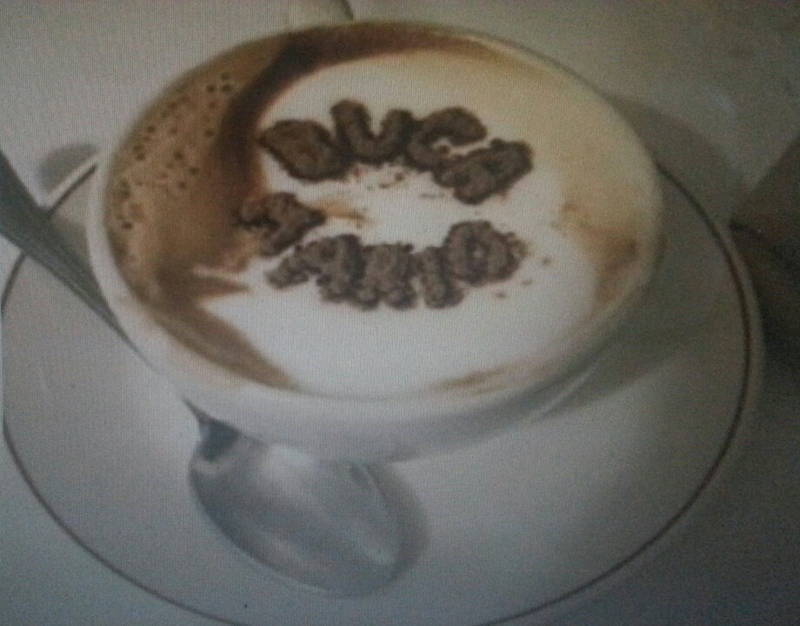 The prettiest cup of coffee, or cappuccino, that I’ve seen was in Florence’s famous ristorante BUCA MARIO. This past May I had the delight of taking my nephew Scot there for his birthday and I must say we were both surprised to see the decoration on the steamed milk. I’ll close by saying I hope all of you coffee drinkers enjoy your “cup of Joe” as Scot did in Firenze. Thank you for your painting of “JAVA”, Christopher. It taught me a lot! This blog is dedicated to my brother Joe. “RED APPLE” is an original oil painting by William Evans, resident of the Peach State, Georgia. William suffers from Essential Tremors, a complex neurological movement disorder. He loves to paint southern rural landscapes. 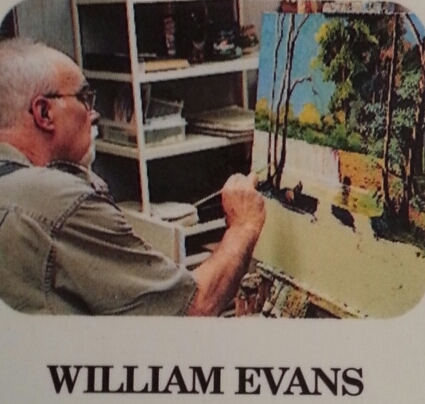 This greeting card was reproduced from an original artwork by William Evans for THASC Sales Co. which has employed a unique group of handicapped artists who create art to help rehabilitate themselves. They gain self-respect and pride through their artwork. When the air begins to feel crisp we are reminded that Fall is upon us, and that can only mean its apple picking time! It is also the time for the other related goodies to America’s second most valuable fruit (after oranges) to come along as well: apple cider, apple pie, and apple turnovers, just to name e few. I can’t wait to taste them all as soon as the season rolls around. Many local orchards are open for picking apples as well as taking hay rides, getting lost in a corn maze, and in some places, trying apple doughnuts! 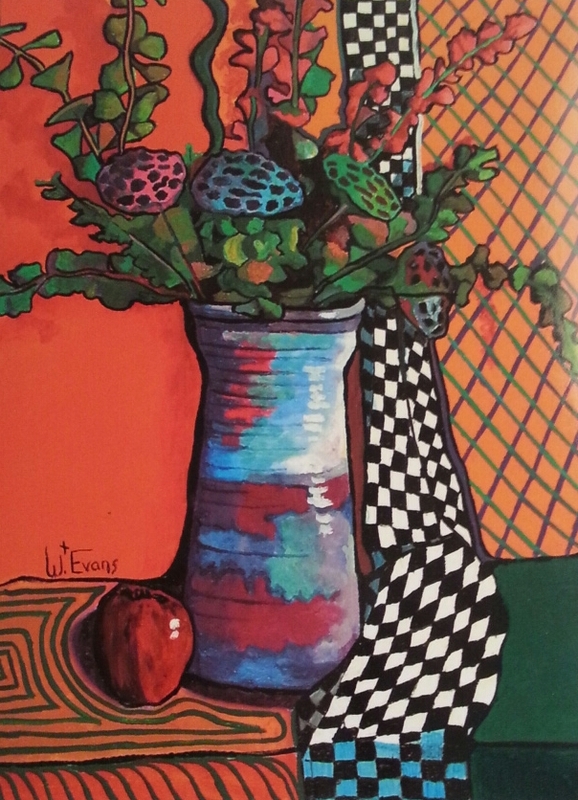 With all that is going on in THASC artist William Evans’ painting “RED APPLE”, from the lovely vase to the colorful ferns and mushroom ornaments to the black and white checkered scarf, the focus is still drawn to the simple red delicious apple perfectly placed at the base of the left side of the vase. 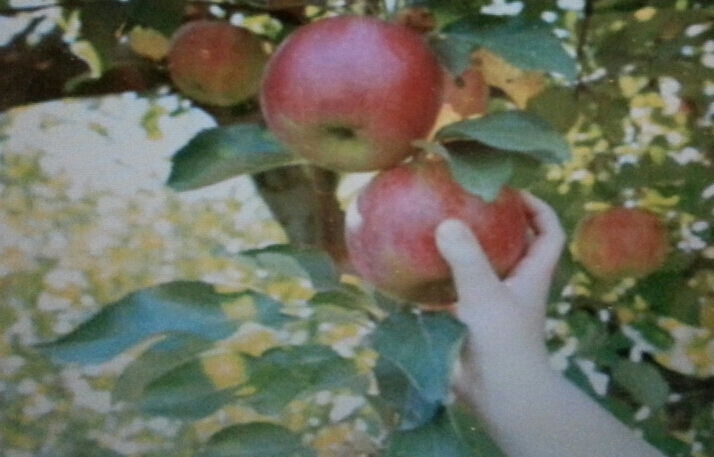 That is what he wants us to see the most amidst his extravagant background: the basic fruit of life. It invites us to take that first succulent bite! 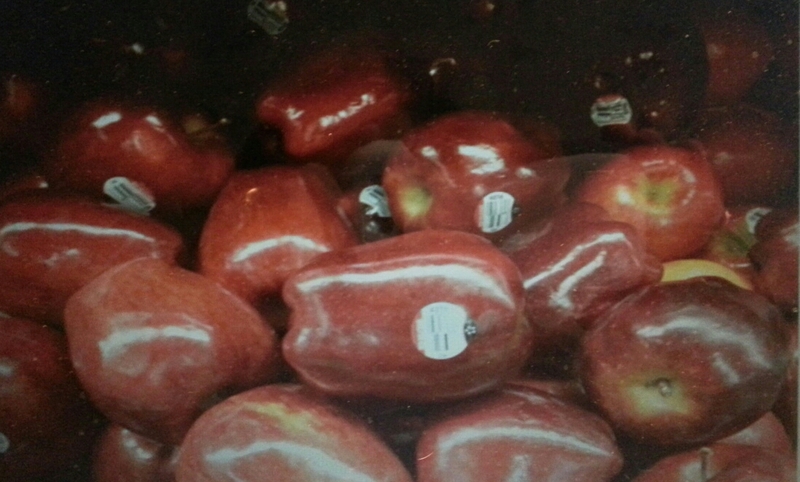 The red delicious variety is my favorite type as depicted above. Did you know it is the most widely grown variety in the U.S. with 62 million bushels harvested in 2005? Two pounds of apples makes one 9” pie. 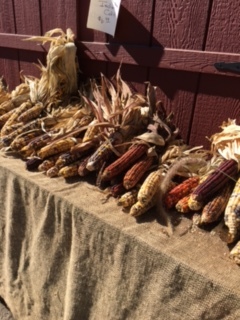 2,500 varieties are grown in the U.S. while 7,500 varieties are grown throughout the world. Apples are fat, sodium and cholesterol free. World’s top apple producers are China, United States, Turkey, Poland and Italy. Archeologists have found evidence that humans have been enjoying apples since at least 6500 BC. It takes about 36 apples to create 1 gallon of apple cider. Please take a minute to comment on the blog after reading, I enjoy hearing from you. Have a pleasant holiday weekend and how about trying some apple picking for a change! See you next Tuesday, October 13, 2015. “AUTUMN IN THE MOUNTAINS” is an original oil painting by Fern Marvel, resident of the Beehive State, Utah. 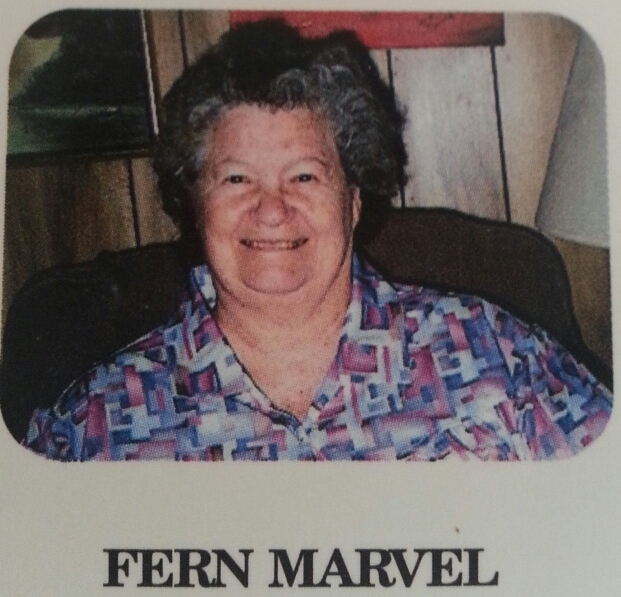 Fern suffers from severe arthritis and is dependent upon the use of a wheelchair. This greeting card was reproduced from an original artwork by Fern Marvel for THASC Sales Co. which has employed a unique group of handicapped artists who create art to help rehabilitate themselves. They gain self-respect and pride through their artwork. There are not many things in New England that are more breathtaking for us than the transformation of our maple tree’s leaves into brilliant Fall colors especially during the month of October. I take my deepest breath when I first catch the glow of the red, orange and yellow trees that begin to line the streets and country roads, but especially those in northern New England’s White and Green Mountain ranges in New Hampshire and Vermont, not to take anything away from western Massachusetts and the Berkshires. In fact if you are planning a road trip during the peak weekend, which is usually Columbus Day, you’d best make your reservations at least a year in advance. THASC artist Fern Marvel clearly expresses this feeling in her oil painting, “Autumn in the Mountains”. 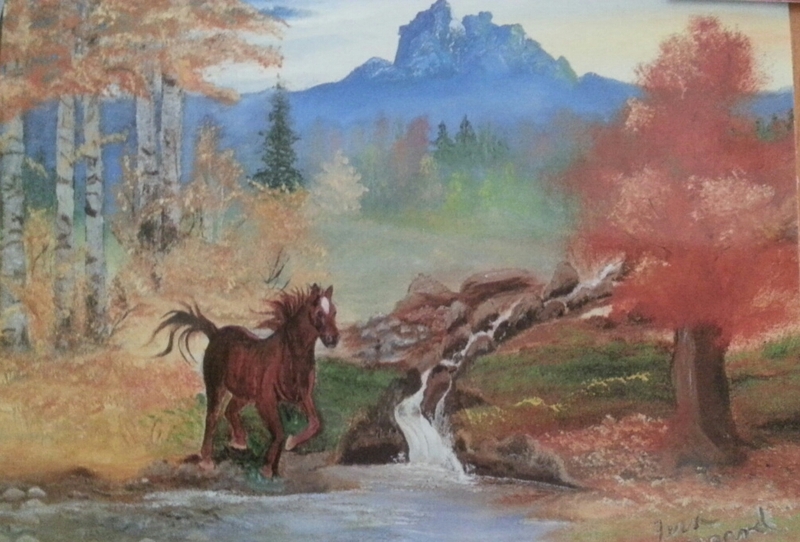 Her golden and reddish leaves are highlighted by the rush of the stallion down the mountain accompanied by a beautifully flowing stream. In the background, the mountains are dotted with the beginning of colorful trees. I always wait in anticipation for the leaves on my street to begin their alteration and then, the true meaning of Fall occurs, as you can see on my front lawn, laying an orange and yellow blanket of leaves that fall to the ground inviting you to kick through them for fun, much like the stallion depicted by Fern stomps his way through the fallen leaves in her painting. As her gallant horse seems to leave the beauty of the autumn mountains behind, we are reminded of the cold winter, which, unfortunately, awaits us ahead. Ere winter turns this place to bleak. We still have some time before the peak color from the mountains arrives in our neighborhood. 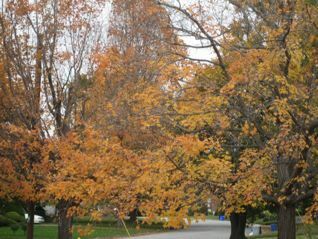 I’ll leave you with images of the glowing colors of Fall yet to come to my neighborhood this year. Please comment on the blog after you read it. I’d love to hear about Fall in your neck of the woods.